Fairfield Ludlowe coach Brian Silvestro is seen coaching against Ridgefield a year ago. The second-year coach provides his club with a poised, but intense atmosphere that makes the Falcons successful. If you see the Fairfield Ludlowe boys basketball team, you've obviously seen its stoic coaching staff. The Falcons are led by two of the coolest cats around. If you see Brian Silvestro or John Dailey on the sidelines, you notice they're constantly coaching, but carry themselves with a terrific demeanor. They're not yellers, they don't have `antics' and yet somehow their team continues to play with exceptional energy every night. Maybe it's just the Falcons showing some pride in their program. Or maybe it is Silvestro giving off a calm, yet fiery demeanor. 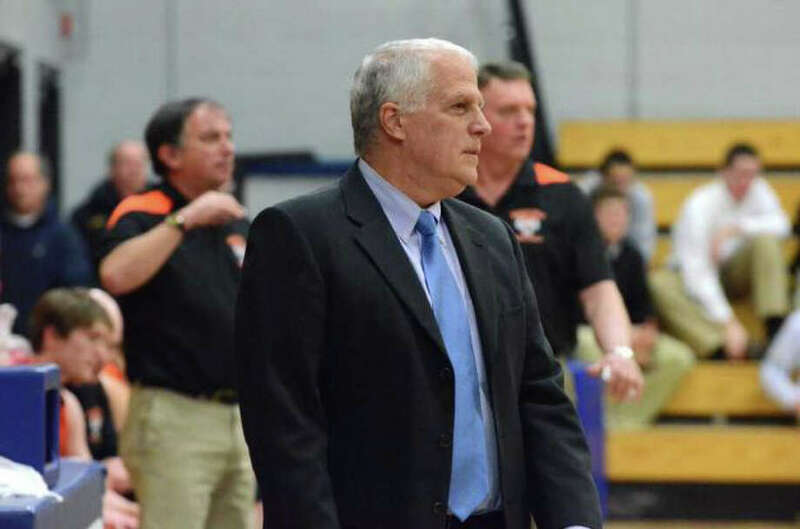 After the Falcons' opening night, 59-52 win at Wilton, he told me he wasn't going to get a heart attack coaching Ludlowe this, his second year as the team's head coach. And yet, if you watched the Falcons on Wednesday, you'd have seen a dialed up effort from even last year. They battled for loose balls, Ludlowe out-rebounded the Warriors 29-16, and controlled the second half at Wilton. Silvestro told me before the year the Falcons would have to play with intensity on defense every night. Consider night No. 1 a success. Silvestro and Dailey are both quiet-types. They would not ever be confused as `fiery'-- even in a game setting. They're not going to throw clipboards. They're not going to put forth the histrionics that put themselves on the stage. Yet somewhere within the Falcons' program lies this quiet intensity and motivation. Maybe it comes from Silvestro's staunch desire to coach team-defense and maybe he bred the current batch of ballplayers to have it during his tenure as the team's junior varsity coach. But in the absence of superstars, Ludlowe is relying on team and intensity to win games. That recipe was dreamed up by its coaching staff and has been executed ever since Silvestro took over a year ago. I guess when Silvestro talks, his team listens. Even if he's talking in monotone.